In a city of living bone rising high above the clouds, where danger hides in the wind and the ground is lost to legend, a young woman must expose a dangerous secret to save everyone she loves. Kirit Densira cannot wait to pass her wingtest and begin flying as a trader by her mother’s side, being in service to her beloved home tower and exploring the skies beyond. When Kirit inadvertently breaks Tower Law, the city’s secretive governing body, the Singers, demand that she become one of them instead. In an attempt to save her family from greater censure, Kirit must give up her dreams to throw herself into the dangerous training at the Spire, the tallest, most forbidding tower, deep at the heart of the City. As she grows in knowledge and power, she starts to uncover the depths of Spire secrets. Kirit begins to doubt her world and its unassailable Laws, setting in motion a chain of events that will lead to a haunting choice, and may well change the city forever – if it isn’t destroyed outright. I could stare at the cover for a long time and still not see all the details! 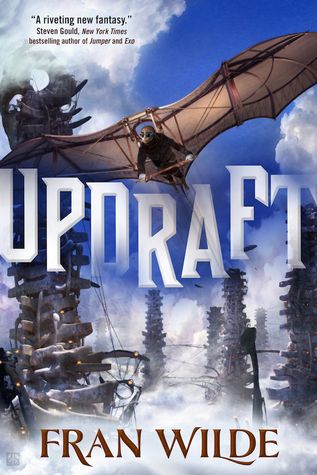 The best part of Updraft was the world building. Imagine a city in the sky, where people travel by wings of their own design, trade among growing towers, and are fearful of invisible, but very real, “skymouths” that will eat them out of the sky. It’s such a distinct concept, that I really enjoyed learning all the different aspects and how the society functioned. The more Kirit discovered about her past and about the society overall, the more obvious it became that the people in power were suppressing the normal people. If someone became out of line, they would immediately be punished, and in some cases, banned from civil life and forced to live “down tower,” which is another way of saying the slums or the lower caste of society. The higher in the tower a person or family lived, the better off they were. Or perhaps, the better they were at keeping secrets. Eventually Kirit becomes a member of the Singers, they grey robed secret society that protects the city. As Kirit discovers more about the Singers, she discovers more about her past and what the cost of protecting the society really is. Like I mentioned, the world building is really the foundation of the story that kept me reading. Understanding more about the threat of skymouths, the Singer’s purpose, how side characters are actually more relevant to the plot, it all adds that dimension that kept me reading. What I found the most frustrating was Kirit’s journey. She consistently doubted her skills and her knowledge, yet when she’s tested on it, she excels. Even when she’s tested as a Singer she struggles, but learns so quickly as to surpass the person she’s learning from. And her doubts are very much what makes this a young adult novel. She lacks maturity to see why the Singers are a political group as much as a group that protects. To the author’s credit, instead of having a love triangle, or other romantic subplot, this novel doesn’t have one. Mostly because there was not enough time to develop it. Her male friend, Nat, is described as brotherly, and her mentor is only that, a mentor. In a category that is saturated with love stories, this one, thankfully does not have any to worry about. However, for all the narrative of Kirit struggling, I found her story to be predictable. She’s the one who brings down the society, forces its secrets to become public knowledge. (Trying not to be spoiler-y here). It’s frustrating because this narrative has been seen so many times. I am curious what the next book in the series will be about. I hope that Nat doesn’t fake die, like, 100 times in the book, it gets a bit old to use that as her motivation. Either he’s dead or not. Pick one! I would recommend this book for fantasy fans who are looking for unusual world building, but with the caveat that the plot is definitely for young adult audiences.